Great for the bath, pool, or beach, your child will love drying off in this beautifully designed Marvel Avengers Hooded Towel. Measuring 22.5 inches x 51 inches, the Avengers Infinity War Hooded Towel is made of 100% cotton terry and includes corner pockets making it easier for your little one to wrap themselves up after a dip in the water. Towel is fade resistant, absorbent and easy to clean. Enjoy your favorite Avengers superheros Captain America, Iron Man, Spiderman, Black Panther, Thor, Rocket & Groot now at home and in the sun! SUPER SOFT & ABSORBENT - Hooded Towel measures 22.5 inch x 51 inch. This towel is made from 100% cotton terry ensuring softness while also being the highest quality in drying technology. Breathable fabric allows for absorbency while also being comfortable to touch. FUN DESIGN MAKES FOR A GREAT GIFT - Bring home your favorite character with this Marvel Avengers Infinity War Hooded Towel. Corner pockets make it easy for your child to wrap themselves after a dip in the water. Great for the bath, pool, or beach, your child will love drying off in this beautifully designed towel featuring their favorite superheros Black Panther, Captain America, Iron Man, Thor, Rocket and Groot. EASY CARE & DURABLE - Towel is fade resistant and stays soft through many washes. To clean, machine wash cold. To dry, air/tumble dry on low. 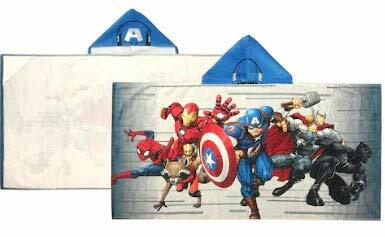 SHOP THE AVENGERS COLLECTION - Enhance your child's Bath and Bed experience with our other Avengers products - Coordinating bedding, bath, and beach accessories available (sold separately). OUR FAMILY COMPANY - Our company is still small and family run. We take great pride in our products and our unsurpassed customer service. We know that our wonderful customers are the reason we are in business! We offer excellent quality, non-toxic products. With our coordinating accessories, you can mix and match our high-quality and unique boys and girls bed, bath, and beach products. If you have any questions about this product by Jay Franco, contact us by completing and submitting the form below. If you are looking for a specif part number, please include it with your message.